Original airdate November 9, 2018. The ladies will kick it: While going door to door as a U.S. Census volunteer, Evan discovers there’s another Chinese family in the neighborhood (Reggie Lee, Ming-Na Wen, and Jimmy O. Yang). The Huangs and the Lees are overjoyed, but Louis feels his new buddy moving in on his friendship with Marvin, and Jessica becomes disillusioned when Elaine turns out not to be the role model she hopes. Eddie and Emery, inspired by Evan, pose as Census volunteers in order to find out which neighbors have their own swimming pools and when during the day nobody’s home. The rhyme that is wicked: I’m not going to lie. I’m totally here for anything Ming-Na is in (okay, except Agents of S.H.I.E.L.D. ), so I was going to like this episode almost no matter what. Add Jimmy O. Yang, this year’s runner up (to Awkwafina) for Summer of ________ status, and I’m willing to forgive almost anything. I love the decision to play Queen Latifah’s “Ladies First” when Elaine saunters up to the mural wearing her low-rider jeans. Everyone bows to Ming-Na. There’s an interesting and almost surely deliberate irony when Jessica twice, in the company only of Louis and the Lees, utters stereotypes of Chinese people and Jewish men in an episode where she protests the stereotypical portrayal of Asians in a school mural. I am not smart enough to break it down, so somebody please do it in the comments! Deirdre is hilarious in this episode. I said I’d be willing to forgive just about anything. Among “anything” are tons of overacting by all the principals including the guest stars (but not including Yang). Is “whale tale” an anachronism? FOB moment: The Huangs welcome the Lees with a fruiting lemon tree. Soundtrack flashback: “Ladies First” by Queen Latifah (1989). If you haven’t heard the early Latifah stuff, I recommend it highly. Get evicted: The episode is rescued from a C by the end, with Horace’s redo of the We Are the World mural, plus of course the guest cast, whom I adore. 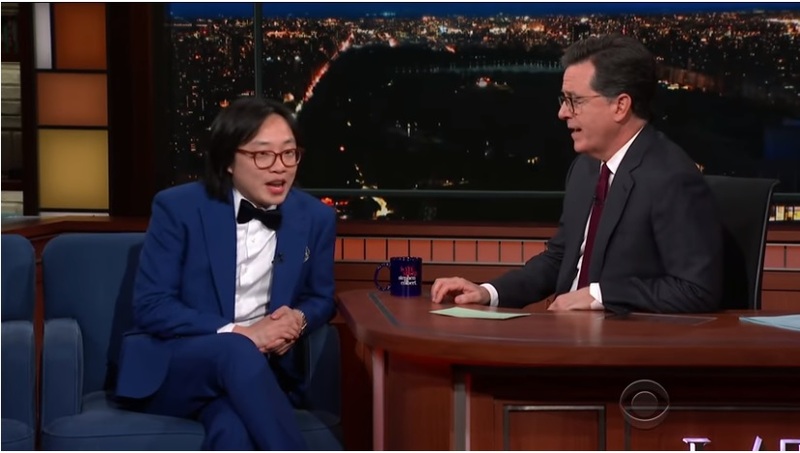 B.
I’m a big fan of Stephen Colbert and saw that Jimmy O. Yang, of HBO Silicon Valley fame, was going to be on the show, I was curious as to learn more about him. As I’ve blogged before, I am not a big fan of his character on Silicon Valley, but I was open to learning more about him and was pleasantly surprised that he came to the U.S. at age 13 from Hong Kong, was not a model minority student, and had no idea what to do with his economics degree from UCSD, which took him five years (and he didn’t get into UCLA or USC where he wanted to go, and certainly not Yale, where the previous guest had gone). He was pretty personable and funny during the interview – his first ever on a late night talk show (though he did a stand-up act once on Arsenio Hall). He talked to Colbert about how he got into the industry and that by coincidence, Mike Judge, one of the creators of Silicon Valley was his commencement speaker and he eventually got his break because of Judge.